Heatmiser Touch V2 is our all new Touchscreen series. Heatmiser Touch v2 offers a great upgrade route for those with an existing dial thermostat or for those looking to measure the temperature remote from the thermostat. In addition to the wireless air sensor, a wireless window/door switch can be paired to the Touch V2 Thermostat, automatically switching the heating to Standby Mode whilst the window/door is open and then returning to normal mode when the window/door is closed. The Heatmiser Touch v2 can work in Thermostat or Timer mode. When operating in Heating Mode, the Heatmiser Touch v2 can be paried to our Wireless Air Sensor where a number of options are available. A Wireless Door/Window Switch can be paired to the Heatmiser Touch v2, automatically switching the heating off when the window or door is opened. 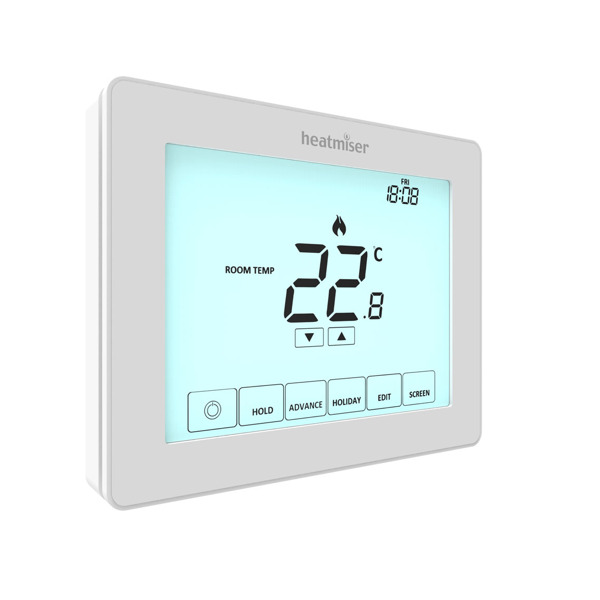 A maximum of 16 wireless air sensor and window/door switches can be paired to a single Touch v2 thermostat. Wireless Sensors are not included.